This not tournament. This for real. You can tell by the very commonplace setting. The second Karate Kid is sort of goofy (in ways the first one isn’t, I mean) and it definitely veers into hard melodrama by the end, but for the most part it works. The two main protagonists get uprooted to a whole new environment, much of the character focus gets shifted from student to teacher, and all the stakes are raised. It’s a bit of a cash-in but for the most part its heart is in the right place. It also takes place in that weird Hollywood version of a foreign land where all the locals tend to speak heavily-accented English to each other instead of their native tongue, even when no English-speakers are around to be included (or English-speakers are there but the natives have no reason to care about them understanding), but let’s not get into that. Daniel LaRusso, six months removed from the events of the first film, a high school grad and newly single– after all those beatings, Ali ended up ditching him for some college football player (real nice, lady). Played by Ralph Macchio. Trained by: Kesuke Miyagi, who he has remained friends with, though it’s unclear if they’ve continued karate lessons in the meantime. Even if they have, certainly not at the previous intensity, since the prologue makes clear that Daniel won’t be competing in tournaments anymore– “karate for defense only,” after all. Basically, Daniel’s skill level can’t be that far advanced from where it was at the end of part one. Played by Noriyuki “Pat” Morita. Chozen Toguchi, the protege of Miyagi’s old rival. He’s all the worst parts of Johnny but turned up even louder, with an added real-world edge– Johnny was just a mean kid, but Chozen is a genuinely vicious grown-up. He’s not a bully but a straight-up thug and a particularly methodical, clever one at that. Played as completely unlikeable by Yuji Okumoto, yet with an undeniable charisma. Trained by: Sato (no other name given), Chozen’s uncle and Miyagi’s childhood best friend-turned rival. Though they were like brothers growing up, Miyagi’s perceived slight against Sato’s honor turned him into a vengeful, hardened man. Since he and Miyagi trained under the same teacher (Miyagi’s father), they know all the same skills… and so, by extension, does Chozen. Played by the late Daniel Kamekona. Once again, the bad guys are the snappier dressers. The Setup: Miyagi has returned to his homeland of Okinawa upon receiving word of his father’s impending death, and Daniel-san has tagged along for the ride. He’s barely stepped off the plane before he re-encounters Sato, whose feud with Miyagi hasn’t cooled in the 50+ years since the latter bugged out rather than fight him to the death over a girl (strangely, in all that time Sato never even tried to get Miyagi’s American address). As Miyagi grieves for his father and reconnects with his old flame, he has to deal with constant harassment from the wealthy Sato and his protege Chozen, who use increasingly unsavory methods to try to goad Miyagi into a duel. One would think that in 1985 even a remote, tradition-bound Okinawan village wouldn’t still be tolerating such things as blood feuds like we’re back in the Shogunate or something and somebody could have called the cops on Sato, but whatever. However, Sato does a Heel Face Turn after Miyagi selflessly saves him during a typhoon, and realizes how foolish he’s been (this is good character stuff, but it tragically robs the audience of an epic Miyagi/Sato duel. I would pay SO much to see that). Chozen’s cowardice is exposed during that same storm and Sato disowns him. This turns out to be a big mistake, because a few days later as the village is celebrating the O-bon festival in a historic castle, Chozen ninjas his way in and holds Daniel’s rebound Japanese girlfriend hostage at knifepoint in an attempt to reclaim his honor. Part II does flip the original’s script a bit when it comes to the bad guys: here it’s the student who’s a legitimately irredeemable sociopath, and the teacher is just a misguided fool who needs to see the light. Though in many ways it doesn’t, because Sato surely played a part in shaping Chozen into who he is over the years, and indeed if Johnny had never been humbled he might have grown up into a Chozen himself. Anyway, the deranged Chozen demands a real fight with his rival LaRusso. Note that before this, pretty much every time the two have skirmished in the movie Chozen has whipped Daniel but good. No small wonder: Daniel’s an amateur and a novice, but Chozen’s a pro. Besides that he was already pretty morally unhinged so he’s willing to do whatever it takes. Also it’s not gay to notice that Daniel could never measure up to Chozen’s totally sick torso. Regardless, with the whole crowd looking on but separated by the moat (more fights need moats), Daniel squares off against Chozen for his first serious throwdown. Chozen doesn’t take it quite so seriously. The Fight: Overall, it’s pretty ugly for Daniel, but he gets in just enough licks to keep it from being one-sided. As with before, the moves are more realistic, or at least the Hollywood version of realistic. Also realistic is that these two get positively brutalized during the brief minutes of this fight– as it goes on, they’re increasingly tired, sweaty, bruised, and bloody. There are no “rounds” like in Daniel’s only other true karate experience, only pauses while the two fighters catch their breath. In execution it’s actually quite sustained and substantial, but also so straightforward– there is little in the way of scenery changes, fight-altering injuries or extra combatants– that unless you describe it literally blow-by-blow it sounds like there’s not much to it. There are a few stand-out moments: Girlfriend-san rather ineffectively tries to help Daniel by attempting to choke Chozen with her scarf (really? Should have gone for the knife he dropped, genius) but just ends up getting punched in the face for her trouble. Also, Chozen easily blocks the Crane Kick. See?? No move is indefensible. The basic rhythm is that Daniel takes some serious punishment, then eventually rallies against Chozen, who finally counters before Daniel can put a lasting hurt on him. After a while things are looking pretty dire for LaRusso, until Miyagi removes his ceremonial Den den Daiko drum and starts “playing” it, shortly thereafter joined by Sato and the rest of the crowd (apparently the drums are standard issue for O-bon, sort of like an Okinawan vuvuzela). The cacophony unnerves Chozen a bit, and reminds the exhausted Daniel about the simple pivot/block/counter at the heart of Miyagi family karate. So as Chozen lunges in to attack again, Daniel uses his body as an anchor while he alternates simple yet deadly swinging punches, each one connecting with Chozen’s face. 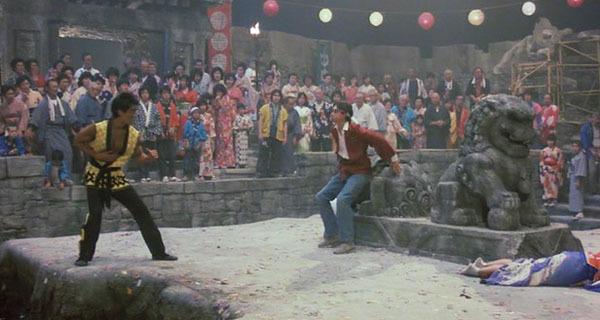 Again, as with the Crane technique, it’s not really clear why this works in a practical sense– can’t Chozen just attack in a way that doesn’t put his head directly in punching range?– but it does carry a sort of primal weight so that it works in a cinematic sense, even if it’s not as iconic as the Crane Kick. Notably, similar (possibly the same) music plays during each climactic moment in both movies. Now with Chozen at his mercy, Daniel echoes Kreese’s defeat in the film’s prologue and acts as if he’s ready to deliver a killing blow. Upon hearing the latter after giving Chozen the old choice of Live or Die, Daniel replies “wrong!” and gives his nose an audible honk. It… doesn’t really work. As much as I love Ralph Macchio (everyone does, except Barney Stinson), he doesn’t quite pull off the edgy gravitas required to make the audience, or even Chozen, believe that he was genuinely prepared to kill someone in that moment. And the “honk” bit rings false, both times it’s used in the film. It is of course supposed to be a silly and undignified thing for the victim to undergo in the movie, but it still just comes off as unacceptably corny. They could have found better ways to defuse the tension of the moment while still giving the villain a pathetic finish. Regardless, the crowd still goes wild for Daniel, just like before, and a few moments of joyous celebration later the credits roll. Coming Attractions: The best argument for letting Chozen kill Daniel. This entry was posted in Karate Kid series, The and tagged martial arts, one-on-one, The Karate Kid. The crane kick performed right, no can defend… Unless you are in Okinawa. I saw 1 as a young teen and it was a great movie then, still good now. I saw 2 in the theater and it was ok. I wisely avoided everything that came after and look forward to you validating my decision. The next entry is mostly just me spitting and cursing.